Is your pool workout lacking something? 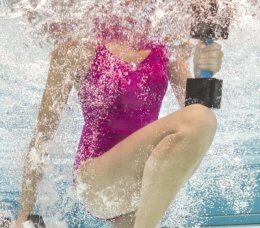 There are only so many pool cardio exercises that you can do before incorporating toning exercises into your water workout routine. In this three part series, we will explore various exercises that target toning specific parts of the body. Today, we will be focusing on legs! We know that many cardio pool exercises improve tone in leg muscles, like treading water and flutter kicks to name a few, but to really kick it up a notch and tone those legs you should think about adding these to your water fitness workout or water therapy. This exercise works best in chest high water. Stand with your feet flat on the pool floor, legs together. Keep your arms straight under the water along your sides. Jump up moving your legs apart sideways and land with them slightly wider than your hips. While doing this, move your arms sideways away from your body keeping your hands open. Then move your hands back towards your sides, while you jump to move your legs back to your standing position. In chest high or waist high water, stand perpendicular to the pool with your left side facing the wall. Brace yourself with your left arm on the side of the pool. Raise your right leg as high as you can to your front or side and then lower slowly. Do this as many times as you are able to. Then switch sides. This exercise works best in waist high water. Tie a noodle around your foot into a knot. Stand with your back against the pool. Keeping your foot without the noodle flat on the floor, lift your other leg with the noodle attached to a 90 degree angle. This should look like one leg is sitting in a chair. Lower that leg back to a standing position slowly. Repeat as many times as you can. Then remove the noodle, tie to the other foot and switch sides.